Grow your animal. Teach him to speak. 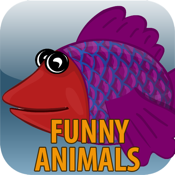 Make funny videos with your animals and share this videos with your friends. This game is for people who have a sense of humor and a desire for creativity. The game is a mixed genre, on the one hand, this is «Tamagotchi» - you can grow your pet, and the other is «Talkings» which repeats any words and special sounds funny voice. The main feature of the game: the voice of a character you can change and create by yourself! Video with funny animals can be sent to the e-mail or a page on Facebook. And if you make a funny joke, your video may be the most popular on Youtube or Facebook.